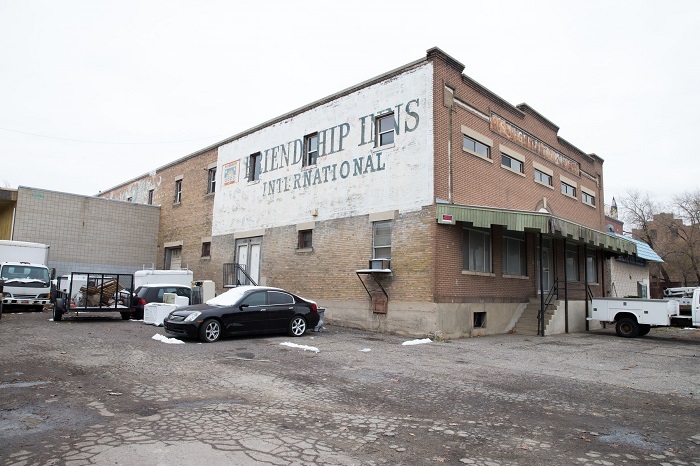 $2 million in preservation funding is up for grabs, and the Salt Lake City Department of Economic Development is in the running to receive a preservation grant to fund Project Rudy, a building rehabilitation effort in the commercial district, as part of Partners in Preservation: Main Streets. 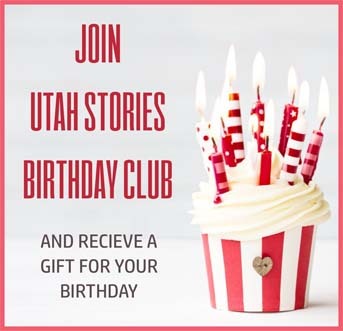 Partners in Preservation: Main Streets, a campaign launched today by American Express and the National Trust for Historic Preservation, in collaboration with Main Street America, will award $2 million in preservation grants to historic sites on Main Streets across the U.S. — and the public will help determine if the Salt Lake City Department of Economic Development will receive funding. At VoteYourMainStreet.org, the public can vote daily, through October 31, for the 25 sites across America that are part of the program, from the famous Formosa Cafe in Los Angeles, CA to the historic Alabama Theater in Birmingham, AL, to the ghost signs of Chinatown in Seattle, WA. The Hide Building would be part of the redevelopment project at the Granary District. 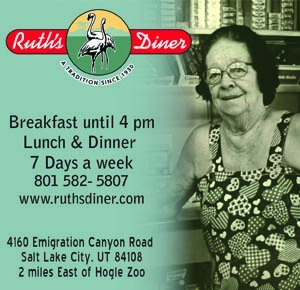 The Salt Lake City Department of Economic Development would use the funding for Project Rudy, a major outdoor products retailer who would be partnering with a local ski manufacturer, both going into an existing building in one of Salt Lake City’s Redevelopment Agency project areas. This is also an area with a Main Street America designation. A building of this size is one of the larger and core buildings within the commercial district, and its rehabilitation and subsequent company’s success is integral to the neighborhood’s success. Funding to rehabilitate the existing building makes it significantly more attractive to a large-scale company to relocate or expand in the area. American Express and The National Trust for Historic Preservation, in collaboration with Main Street America, announced today that Partners in Preservation is headed to Main Street. Partners in Preservation is a community-based partnership to raise awareness of the importance of preserving historic places and their role in sustaining local communities. This year’s program, Partners in Preservation: Main Streets, will award $2 million in grants to Main Street districts in need of preservation support across America. 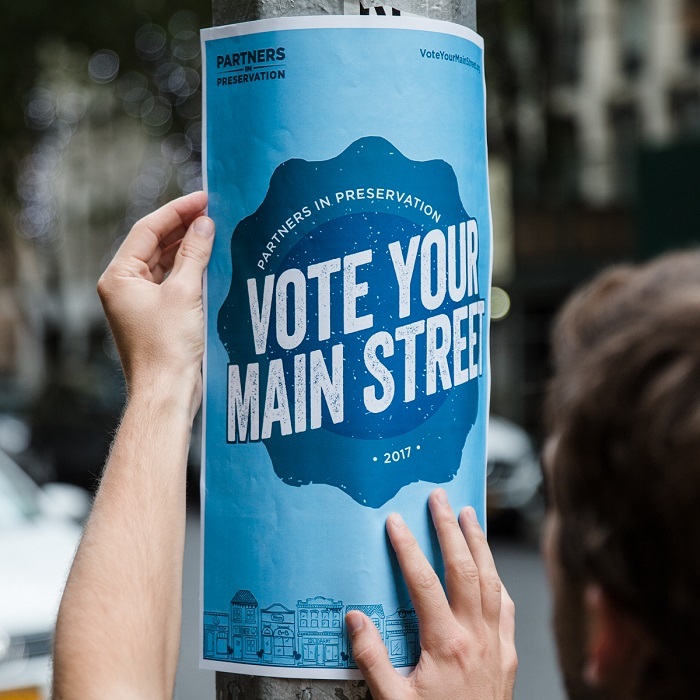 The public will determine which sites will receive preservation grants by voting for their favorite main streets today through October 31 at VoteYourMainStreet.org, hosted by National Geographic Travel. On November 2, the sites with the most votes at the end of the voting period will be announced and awarded grants for restoration projects. In addition, the public will also have the opportunity to enter a sweepstakes for a chance to win a trip of their choice to New York, Los Angeles, or Miami, sponsored by this year’s media partnerNational Geographic. This year’s campaign coincides with the 40th anniversary of the National Trust for Historic Preservation’s work to revitalize main streets. Partners in Preservation: Main Streets emphasizes the importance of these districts around the U.S. and their positive impact on local communities and economies. According to 2016 data from Main Street America, investments in Main Street districts have a significant impact on local economies – encouraging real estate development as well as the creation of new businesses and jobs. In 2016, $4.65 billion reinvested in Main Street improvement programs resulted in 8,042 building rehabilitations, 5,616 business openings, and 27,462 new jobs. Main Street revitalization efforts also help to make our neighborhoods more interesting and welcoming places to live, work and play. Since the program’s inception in 2006, Partners in Preservation has awarded over $19 million in support of more than 200 historic sites across the country. From theaters and museums to plazas and marquees from Seattle to Miami, Partners in Preservation: Main Streets will inspire long-term support from local citizens for the historic places in Main Street corridors. Each local partner received a grant of $20,000 to increase public awareness of the importance of these historic places and build grassroots support for their Main Street district. Sweet Auburn Works seeks to transform Bryant Graves House into an information center for visitors. This project would help introduce visitors to the local businesses and organizations that define Sweet Auburn. REV Birmingham seeks to install a 42-foot vertical marquee on the Historic Alabama Theatre. This project would restore the façade of the theatre to its original appearance and light-up downtown Birmingham. Upham’s Corner Main Street seeks to transform the Pierce Building into a business incubator and convert the Streetcar Comfort Station into a bike repair store and coffee shop. This project would create a vibrant hub within Dorchester’s Arts and Culture Innovation District. Old Town Cape, Inc. seeks to revitalize the bandstand and surrounding park landscape in Ivers Square. This project would honor the neighborhood’s history and attract visitors. Casa Grande Main Street seeks to create a new Vintage Neon Sign Park by salvaging historic neon signs from throughout the community. The park would serve as a vibrant downtown destination for visitors. The Cincinnati Preservation Association seeks to restore the Woodward Theater’s historic marquee. This project would attract visitors and make the theater a shining beacon in Over-the-Rhine. Live6 seeks to transform The Treehouse into a unique gathering and performance space. This project would create a much-needed venue for the Livernois/6 Mile community to come together. The Heritage Foundation of Franklin and Williamson County seeks to rehabilitate Dr. McPhail Office as a space for local programming and visitor services. This project would share Franklin’s history and highlight the positive impact of preservation on the community. Downtown Greensboro, Inc. seeks to replace the iconic Carolina Theatre’s worn seats with art deco-style seats that increase capacity and restore historic charm. This project would ensure the theatre remains the “Showplace of the Carolinas” for years to come. The Hyde Park Chamber of Commerce and Hyde Park Historical Society seek to complete renovations on the Cable Car Building. Through this project, the community would continue to have access to a museum and meeting space. Main Street de Las Vegas seeks to restore the E. Romero Hose and Fire Building to serve as a firefighting and acequia system museum. This project would commemorate the stories of the town’s founders and their efforts to protect their community. The Los Angeles Conservancy seeks to rehabilitate the trolley car of the Formosa Cafe along Route 66. This project would ensure a beloved West Hollywood icon is saved for future generations. Main Street McKinney seeks to rehabilitate the exterior of the McKinney Performing Arts Center in the Collin County Courthouse. This project would enhance visitors’ experiences for generations to come. The City of Miami seeks to renovate and paint the exterior of the Manuel Artime Theater. This project would ensure the theater continues to be a place where the vibrancy of Little Havana comes alive. Oretha Castle Haley Boulevard Merchants and Business Association seeks to restore the façade of Old McCrory’s Store. This project would repurpose the space for retail and nonprofit business use and commemorate the 1960 boycott of discriminatory hiring practices. Bedford Stuyvesant Restoration Corporation seeks to rehabilitate the façade and make structural improvements to the Sheffield Farms Bottling Plant in Restoration Plaza. This project would ensure that the plaza remains at the heart of the Bedford-Stuyvesant community. Downtown OKC Initiatives seeks to restore the Yale Theatre to its original appearance. This project would breathe new life into a key attraction, providing a draw for tourism and new entertainment opportunities to the surrounding area. Germantown United CDC seeks to rehabilitate the façade and make structural improvements to significant 20th-century African-American landmarks in the Germantown neighborhood, including the Trower Building and Parker Hall. This project would increase visitation to Germantown and community pride. The Richmond Main Street Initiative seeks to install a marquee on the Market Street Mall’s Façade. This project would create a bright light illuminating the neighborhood’s charm and welcoming visitors. Studio Elevn seeks to rehabilitate three historic buildings in the Granary District. This project would provide space for artists, designers and entrepreneurs to gather, work and celebrate. North Park Main Street seeks to reveal the original façade of the Stevens-Hartley Annex, which has been hidden behind a wall for decades. This project would further beautify one of San Diego’s most celebrated streets. Chinatown-International District Business Improvement Area seeks to restore disappearing historic signs throughout Seattle’s historic Chinatown-International District. This project would help tell the story of this iconic, diverse neighborhood. Main Street Steamboat Springs seeks to restore and repurpose a historic caboose as an artist-in-residence studio and gateway to Main Street. This project would serve as a landmark for the city’s Creative District. Shaw Main Streets seeks to restore the original storefront façade of the James Hughes Building. This project would transform a hidden treasure into a gem for visitors to Shaw. The Historic Valley Junction Foundation seeks to restore the façade, first-floor storefront and marquee of the Lyric Theater. This project would further emphasize the historic gathering place as an icon of main street. For more information and to vote daily through October 31, the public is encouraged to visit VoteYourMainStreet.org.